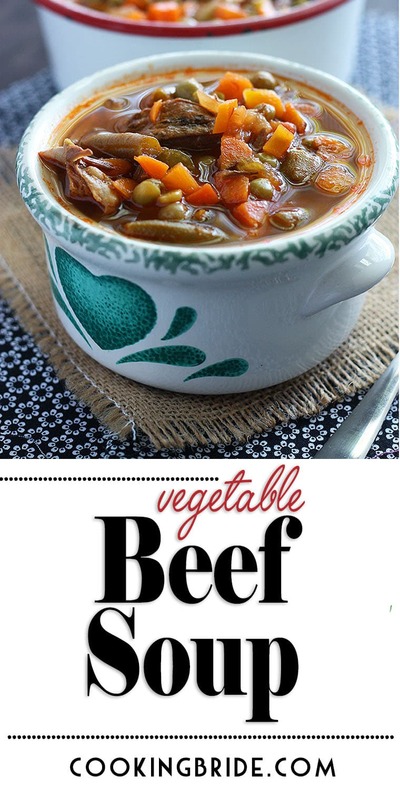 This easy recipe for vegetable beef soup is a great way to use up leftover pot roast. 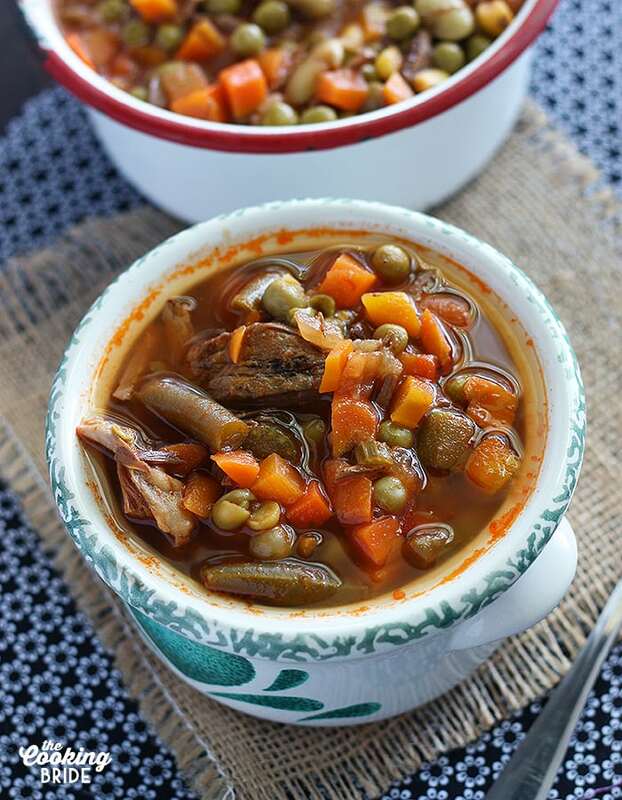 The tomato-based broth is loaded with vegetables. I love finding ways to reuse leftovers. It makes me feel thrifty. Last week we had a cold spell and I was thankful I had pot roast on the menu. 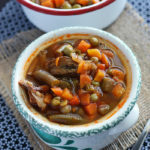 This week, I transformed the leftover roast, carrots, and potatoes into a comforting vegetable beef soup. 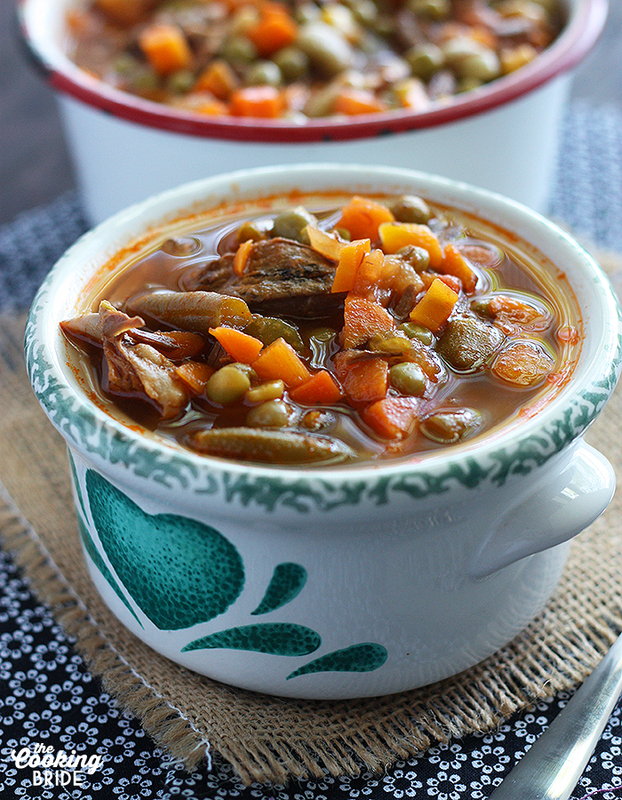 This soup is totally old school. By that, I mean there is absolutely nothing fancy about the recipe. It’s a favorite from The Husband’s side of the family. I imagine it came about as a low cost way for The Husband’s grandmother to feed her four children. It’s pretty versatile in that you can make the base and then add pretty much anything else you want. While the soup was simmering on the stove, I took the opportunity to clean out a few of those plastic storage containers that plague my fridge – brown rice from last week’s stir fry, green beans from Monday’s night’s dinner. It’s total comfort food at its most basic level. Combine tomato juice and water in a large stockpot over medium high heat. Add onions, lima beans, black-eyed peas, potato, carrots and celery. Bring to a boil. Cover, reduce heat, and simmer for 40 minutes. Add cooked rice, pot roast, and corn. Simmer until heated through, about 10 more minutes. This looks really yummy and easy! Thank you!